As everyone knows, my go-to author for hilarious fun in the Britain is Jill Mansell. Her books never fail to make me laugh, cry, or just have a great time as her heroines go on adventures that change their lives — whether its a new career, like in Rumor Has It, or finding the Mr. Right, like in Take a Chance on Me. Her characters are always fresh and quirky, generally naive about themselves and where they are going, and always fun to have at a party. If there were one genre that you would write other than your current women’s fiction, what would it be and why? Have you ever tried to write in it before? How did it go? Do you know, I never have tried any other genre. Sometimes we just have an instinct for what we’re good at and it seems to make sense to stick to it. When I first started writing I did try category romance (Harlequin) because I thought they might be easy. Needless to say, they weren’t! I sent off a few and the reasons for rejection were always that there was too much humour in them and not enough sustained emotional depth. In the end I gave up and wrote the kind of books I would like to read myself…and that’s how I got my first publishing contract. The term chicklit hadn’t been invented back then! You’re forthcoming release in the United States is A Walk in the Park. How does the publishing process in the U.S. differ from others? How did you go about getting books published in other countries? What’s the lag time between when a book comes out in England to when it comes out elsewhere? The time lag varies according to the publisher but Sourcebooks is aiming to catch up with the UK next year and also bring out another of my older books in the US. It’s always entertaining, receiving a long list of British words from my editor that need to be ‘translated’ into American before the book can go to press. We definitely speak a different language! Getting published in other countries is all down to my agent and her sub-agents around the world. It’s brilliant going along to the London Book Fair each year and meeting some of the other agents and publishers from all over. Who are some up-and-coming writers that readers should be on the look out for? I’m not reading much fiction, but two books this year by writers new to me have absolutely blown me away. John Green is a YA author, but this is a book for everyone — The Fault in Our Stars. Astonishing and emotional. I adored this one too, Wonder by RJ Palacio. Just an amazing, incredible book. I also loved The Runaway Princess by Hester Browne, which is great fun and a real feel-good read. I always love Hester Browne’s books. Many writers these days are being told to market their own books through Websites and social media. What’s been your experience? Do you have any tips for others? But I think the reason it is working for me is because I do enjoy it and I’m not just endlessly plugging my own work. I very rarely do, in fact. I find relentless self-promotion from others a huge turn-off and it actually makes me LESS inclined to try a new author’s work. I would far rather think for myself how interesting/fun/nice they are, then quietly buy their book. So the moral of the story is…just have fun and enjoy yourself. The ability to cyber-meet people all over the world is such a magical gift, why spoil it? Just for fun, what television shows or music are you enjoying or find inspirational? Well, inspiration can come from anywhere so I feel it’s my duty to watch lots of TV, all in the name of research. I’m getting into Strictly Come Dancing – our version of Dancing With the Stars. Still watching American Idol and UK’s X Factor but maybe starting to get a teeny bit bored with them now. The revelation this year for us in the UK has been the Olympics followed by the even more amazing Paralympics. We had masses of TV coverage and beforehand many people wondered if the Paralympics would be able to match up. Well, I know there was very little coverage of it in the US but let me tell you, it was BRILLIANT, completely life-enhancing and even MORE enthralling and inspirational than the Olympics. It has genuinely changed the view of the nation with regard to physical disability. The paralympic athletes have become superstars and we love every last one of them – our Superhumans. Inspiration-wise, who could ask for more? Thanks, Jill, for answering my questions. Your books are always a blast. I waited too long to send out my interview questions to poetry bloggers I wanted to profile. I have a crazy life with a 1 year old. I remembered at the last minute that it was BBAW and already had a review scheduled for the week. However, that does not mean that you can’t have fun reading my profile interviews of poetry bloggers. It’s good to highlight these daring bloggers and to see how they view poetry. Plus, I hope they will convince you to give poetry a try. Today, I’ve got a great interview with Gautami of Everything Distils into Reading, who also writes her own poetry, which you can view at Rooted. As a reader of poetry, what is it that poetry can provide that you think other genres do not or what makes poetry unique? Why do you read it? Poetry is spirituality for me, the writing of it, the reading of it. Poetry encapsulates so much in so little. I consider myself a poet first and foremost. It is a way of life for me. Take away my poetry and I am merely existing. Thinking about new readers of poetry, what are some of the mistakes you think they make when approaching a poem? What are some tips that can improve their enjoyment of the genre? Poetry is seldom literal. One has to look for depth. Many times, the reader interprets differently from what a poet wishes to convey. That is good too, because the poet too learns about what the reader thinks. My advice is to keep on reading poetry and the rest will fall into place. About how many books of poems do you review each year on average? Do you have an established goal of how many or is it a more organic process? I used to review 12 poetry books a year. Lately, I have not been able to do so. However, that has not stopped me from reading poetry. I read it all the time, in print form and/or on the net! As someone who lives outside of the United States, do you find that poetry is more popular, less popular, or about the same as it is in American or other cultures? What kinds of poetry books do you find yourself recommending? Poetry is not popular at all. No one wants to read it. It requires deep understanding and patience and no one seems to have any time. I recommend that one should start from reading contemporary poets and go slowly back to classics. Structured poetry is also a good starting point. I did the other way round. I started with classics and now I read contemporary poetry. What are you reading now? How do you view the world of poetry and its future? I am reading Carl Sandburg and loving it. And I do think poetry has a great future. It is not going to die any time soon. Or maybe never. As long as I live, I will keep on writing poetry. Thanks, Gautami, for answering my interview questions. And for participating in my BBAW profile experiment. We are kindred spirits in that without poetry we would merely be existing. As a last profile in honor of Book Blogger Appreciation Week, I sent over a few interview questions to Julie at Read Handed. Her blog has a bit of everything, from poetry to nonfiction and literary fiction, and she’s a librarian who tells her readers that you’ll probably see books on her blog that aren’t what everyone else is talking about. Please check out what she had to say about poetry and blogging. Poetry to me is largely about the words – their sounds, their forms, and (lesser so) their meanings. In poetry, every word is deliberate. In a novel, or even a short story, one word, or even an entire sentence, can be ineffective without lessening the overall work too much. Not so in poetry. That is why it fascinates me so much. Poets are masters of language, knowing when words can be cut to make the feeling more immediate, but also knowing which words are essential to the poem. The biggest mistake readers make when they approach poetry for the first time is assuming there is some secret code – some one singular meaning that must be derived. Then, if they don’t “get” that intended meaning, they feel like they failed at reading the poem. This is not true. Yes, most poets have a “meaning” in mind when they craft a poem, but it is not our job as readers to figure out that meaning. And sometimes, poets leave the meaning intentionally ambiguous. Poetry is what you make of it. Whether it’s a phrase in the poem that just works and stays with you for the beauty of how it sounds, or an image that resonates with you, or a meaning you derived that speaks to you – these things all make for a successful poetry reading. My main advice would be to stop trying to figure out what the “experts” think the poem means, or even what the poet intended the poem to mean. Instead, simply enjoy the poem. Read it aloud, roll the words on your tongue, and delight at how they fit together. I review probably 2-3 books of poems a year. It’s really an organic process, though this year I did have a set goal of 2 for the Fearless Poetry Exploration Challenge. In general, I tend to not read books of poems cover to cover, though that is a great way to get to know a poet. Instead, I read poems randomly, pulling from several books at once. For me, reading poetry is more about the individual poems than the collections. As a librarian, how often do you recommend books of poetry to patrons? Do you find yourself recommending poetry books to friends/family? If so, which ones do you recommend mostly? Well, I work in an academic health sciences library, so poetry does not come up often (i.e. at all) with my patrons. But I do recommend poets to my friends and family. Again, I tend to concentrate more on the individual poem than the collection, and poets in general more than a specific volume. Some poets that I love recommending are Liz Robbins, Gerald Stern, Sara Teasdale, and Lisel Mueller. Not reading too much poetry right now, unfortunately. I’m actually reading an information literacy instruction handbook for work. I have been meaning to read more in my Seamus Heaney collection, so maybe that will be next. I think poetry will continue to be a sort of niche genre. The proliferation of the Internet has both helped and hurt poetry in that regard – it has exposed more people to poetry, but it has also let anyone “publish” their bad poetry. Either way, I don’t think poetry is going anywhere, but I also think that most poets will continue to have a hard time making a living on poetry alone. Thanks, Julie, for answering these questions and participating. 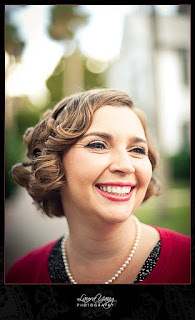 So for my final Book Blogger Appreciation Week (BBAW) profile of poetry book bloggers this week, I’m going with a relatively new reader of poetry, Kelly of The Written World. She’s also the other half of The Poetry Project. As a relatively new reader of poetry, how would you describe your experiences so far? What poems or poets have you loved and which have you disliked? I describe my experiences as a tad bit overly paranoid. I am always worrying that I am not getting the idea behind the poems. As a result I overthink and then miss things entirely. It is a problem I have long had with poetry sadly. I still haven’t read a lot of poetry, but I did enjoy my time with Robert Frost last month. I had read his poetry before, but not in such a quantity. It was basically a poem here and there in school. In the end I read two collections. Because you’re a new reader of poetry, was there a particular catalyst that started your journey to read more poetry? And why had you not read poetry before? A conversation on Twitter lead to the Poetry Project. First, there was just a list of poems to read and then it grew into something more wide-spread. I think it is working having a poetry fan and a not so poetry fan reading together. Leslie says “look at all these wonderful poems” and I slowly explore them and decide it is not so bad. I hadn’t really read poetry before because I don’t get the appeal. I am a novel fan over the shorter types of writing. I also don’t read a lot of short story collections. I am trying to get beyond that, though. As the “other half” of The Poetry Project with Regular Rumination, what are your goals for the project and how did you come up with the monthly themes? Was there a slew of ideas and a particular process of elimination or was it easily agreed upon? 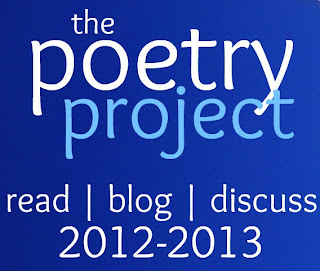 The idea of The Poetry Project is to read more poetry. Now that others are joining in, it is basically to get people reading and talking about poetry more. The themes came about because people felt overwhelmed deciding on what to read. This way they can either read in the themes or still have a chance to explore whatever they want to read. As to the themes, Leslie and I both chose 6 and then rotated months. Some of them are decided for the seasons, holidays, events, etc. that happen during that month. Others were random choices. If we successfully get near the end of a year, we plan to get participants to pick the next 12 themes. Do you read full books of poetry or do you just read individual poems? Have you been reviewing books of poetry on your blog, The Written World? In the beginning, I was just reading a poem here and there. In August, though, the theme was ‘Pulitzer Winners’. I went back to some of the early award-winners and found their collections in the public domain. As a result, I read poetry collections in August. Very impressive for me! Every Wednesday one of us says something poetry related. I just say a few short lines about the poems. I sometimes include favourite lines. I wouldn’t call them reviews, though. What are you reading now? How do you view the world of poetry and its future in your reading life? The theme for September is classics. I have been trying to decide what to read. There is a lot that would fit into that category. One of the few poetry books I owe is a collected works of Emily Dickinson, so I was thinking maybe I would hunt that down. As to the future, I am hoping that I will become comfortable enough with poetry that even without the Poetry Project I will explore something poetry-related each month. There is so much out there that I haven’t tried. It’s a slow process, but I have made big changes so far this year. I would like to think, anyway! Thanks, Kelly, for answering my questions, and I can’t wait to see what the Poetry Project has in store in 2013 and what you discover in poetry. I was honored to win the poetry blogger award for BBAW in the past, but I also thought that any blog featuring poetry should be recognized since there are so few of us. As part of that process, I looked to my network of blogs that I read and love, and thought it would be great fun to profile at least one poetry blogger this week in honor of Book Blogger Appreciation Week. To that end, I sent over a few interview questions to one of my blogging and Indie Lit Award judging buddies, Lu from Regular Rumination. She’s one of the first bloggers I noticed posting about poetry, so I think it’s appropriate that she’s the one I profile today. When did you first read poetry and what drew you to it? Or if you were initially put off by poetry, what changed your mind? I think I first read poetry seriously my freshman year of high school. My teacher passed out copies of Pablo Neruda’s “I could write the saddest lines” and I immediately fell in love. I remember inhaling poetry from then on, but my love for poetry also came from wanting to write it and wanting to write it well. In college, I took as many poetry workshops as I could and now I miss it. I don’t know that I was ever put off by poetry, but I’m not sure I would have fallen in love with poetry if we didn’t have to focus on it in high school. We also were required to write it, which was when I discovered that I really enjoyed it. For me, I often don’t learn to appreciate something until I’ve tried to do it myself. After that project ended, I joined an old AOL message board called My Poetry and Writing, and not only continued to write poetry, but also found my first online community. Now that I’m older and write poetry a lot less than I would like, I read poetry because it is important to me. It is less about learning how to write and more about seeing the world in new, exciting, and beautiful ways. About how many books of poems do you review each year on average? Do you have an established goal of how many you will read and/or review each year? Or is the process more organic? My blog has slowly moved away from reviewing books and I often find myself discussing specific poems over specific books of poetry. I have reviewed several collections over the years, but I rarely have established goals of any sort for my blog. I find that makes me avoid doing them; really, if there’s anything I don’t want to do for my blog, I should just say I’m going to do it. I like my reading to be more organic. I have made a conscious effort, though, to read more poetry every week, whether it is an entire collection, the monthly issue of Poetry Magazine or the daily email from Poets.org. Tell us a little bit about the Read More/Blog More Poetry project (click on the image to learn more) that you started at Regular Rumination and what inspired you to start it and how has participation been? What are some upcoming events associated with the project? What started out as the Read More/Blog More Poetry event has turned into The Poetry Project, which was started by myself and Kelly, from The Written World. It all started as a request on Twitter from a few bloggers for a list of poems. I wrote a list of my favorite contemporary poems and Jason from Moored At Sea made a list of classic poems. Kelly and I started talking about wanting to share the lists and also to convince more people to blog about poetry. Kelly is a new reader of poetry and I think that’s what makes us a good team: we have two very different experiences with poetry, but we both want to read more of it. The Project isn’t really about reading a specific poem or posting at a certain time, though we do have monthly optional themes, it’s really just about getting your feet wet with poetry and with blogging about poetry, if you’re new to poetry, and about making poetry a more visible part of your blog if you’re already a regular poetry reader. What I think has been most successful about The Poetry Project is that anyone can participate, whether you’ve just started reading and blogging about poetry or you’re a seasoned poetry reviewer. It’s turned into a small community of people who are blogging about poetry and how they relate to it. The only real requirement is that you blog about poetry and link back to the post. Kelly and I are committed to including a roundup of each participants posts at the end of the month, so there’s one place where everyone can go back and look to see what we’ve all read and talked about. Participants are even contributing original poetry! It’s been really amazing. Recommend some poets for beginners. Recommend some poetry translations or poetry for those who’ve read more poetry than others. If you’re new to reading poetry, I think Edna St. Vincent Millay, for an older poet, and Natasha Trethewey, for someone more contemporary, are excellent places to start. If you’re looking for something that’s a bit of a challenge, I really recommend Derek Walcott and, in translation, Neruda’s Residence on Earth. 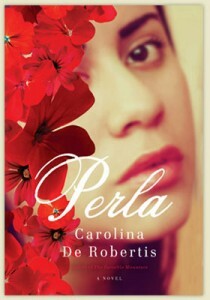 In the US and around the world, Neruda is famous for his love poetry, but the poems in this book are a love poem of a different sort. They focus on the earth and our relationship with our physical surroundings. They are beautiful and sensual and sometimes difficult. Right now, I am still reading some of the collections I have out from the library for last month’s Poetry Project theme of Pulitzer Prize-winning poetry, including Marianne Moore’s collected poems. I am also always reading the Poets.org Poem-A-Day emails. As for the future of poetry… I’m not sure. I think there are enough dedicated readers of poetry in this world to keep it an active and thriving community, even if it is a very small one. I hope that there will be enough English teachers like mine who help foster young people’s passions about poetry. Regular Rumination is my own corner of the web where I talk about books, poetry, crafts, and whatever else is on my mind. I started it back in 2008, while I was home from college on winter break, looking for a great book to check out from the library. My life has changed a lot since then, but my blog has been the constant. 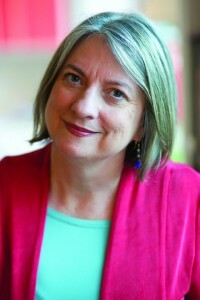 Thanks so much, Lu, for participating in this week’s BBAW profile of poetry bloggers. Welcome to day two of Book Blogger Appreciation Week (BBAW). Today is the interview swap with another blogger, which is always my favorite part. Lit and Life is a blog that I’ve read off and on, though not always commented on, for several years. She’s one of the participants in the WWI Reading Challenge this year at War Through the Generations, and she’s got some fun features. 1. Lit and Life is your piece of the Internet where you talk about books and life. What have been some of your most popular blog posts? Which books have generated the most discussion? What life posts? For my first year of blogging, I was obsessed with my stats. Then I came to realize that as long as I didn’t monetize my blog, I didn’t really care how many people read my blog each day since, first and foremost, I’m blogging for me. Along the way, I’m happy that other people do check in and comment but I can’t really tell you which posts were the most popular. I do always notice that I get a lot more discussion when I review non-fiction books and my Sunday Salon posts always seem to get some discussion going. 2. It says on the about me page that you love flea markets (me too!). Do you just go to browse or do you have specific lists of items you are looking for? What is the most unusual thing you’ve found at a flea market that you just love and why? I always have some things I’m keeping an eye out for when I go to flea markets, “antique” malls and stores and auctions. Old children’s books, pieces of pressed glass that match the ones I collect, frames and architectural elements are always on my radar. But I love to just browse and keep my mind open to interesting new things. Twenty-five years ago, my husband and I found an old kitchen table at an auction that we picked up for five dollars. We refinished it but it’s a table that clearly has a history and I love that about it. I think it tells people a lot about the kind of household we have. 3. If I were to give you a book of poetry, would you read it? Why or why not? If you’ve read poetry in the past, which book or poet have you read and would recommend to others? Absolutely I’d read it although I might have to check back in with you frequently to have you explain it. It’s probably cliche to say it but I do love Emily Dickinson. I must admit that I struggle to read some poetry – I’ve tried to read “Leave of Grass” several times but Whitman really makes you think and I can only read about one of his poems a day. That makes getting through the book endless and I usually end up setting it aside since it’s so long. I did read my kids a lot of poetry when they were growing up – Shel Silverstein and Jack Prelutsky were big favorites and we often did art projects based on their poems. 4. Fairy Tale Fridays is a unique part of your blog. Do you prefer new or old fairy tales? What draws you to these stories and which would you recommend as must reads? I’m a sucker for the old fairy tales but I do love to read the new takes on them. I think the history and the darkness of fairy tales is what really draws me to them. I’m also fascinated by trying to figure out what it is about a tale that made it something that people passed on and how so many of the core stories are found in countries all over the world. There are a lot of great collections of fairy tales, although it is hard to find books that encompass tales from more than one source. There are some great books for children based on fairy tales including Rapunzel Illustrated by Paul Zelinsky and The Stinky Cheese Man and Other Fairly Stupid Tales by Jon Scieszka. Check out Goodreads list of the best fairy tales and retellings for some great adult and children’s books. 5. What are your top 3 go-to book blogs for recommendations and why? It’s funny that my top book blogs have changed over the past three years. In the beginning, I really stuck with the big bloggers, but over the years, I’ve found the blogs that bring me opinions on the kinds of books I like but also expose me to books I might otherwise pass by. Three blogs that are my go-to’s right now are: Book Chatter, Rhapsody In Books Weblog, and Life In The Thumb. But, let’s be honest – after clearing my reader, I still have 75 blogs that I read and enjoy on a regular basis. If you’re interested in the interview she did with me, check it out. This year, I’m taking a different perspective with Book Blogger Appreciation Week (BBAW) in that I’ll be profiling some poetry book bloggers this year, in addition to my traditional participation in a blogger interview on Tuesday, Sept. 11. For today’s post, I’m featuring Jeanne at Necromancy Never Pays, which is the home of Trivial Pursuit for Book Bloggers. Jeanne has helped judge the inaugural Indie Lit Awards for Poetry winners last year, and I always look forward to her reviews of poetry/poetry collections. She takes a nuanced approach to these reviews, often pulling out a favorite poem from a collection to discuss in depth. Without further ado, please check out my interview with her and stop over at her blog for her BBAW posts this week. My parents, especially my mother, read poetry out loud to me. I remember particularly hearing the poems from A Child’s Garden of Verses, Alice in Wonderland, and Through the Looking Glass out loud. She read Dr. Seuss’ Happy Birthday to You out loud every year (she and my brother and I all still recite it–being tall, I’ve always taken particular delight in “the tallest of all-est”). When I got older, she read me poems by Robert Service. Before I learned to think much about the sense of the words, she taught me to delight in the sound of the rhymes. The process is organic. Sometimes I wake up with a certain poem going through my mind. Sometimes I look one up, because I know I’ve “felt” something like this before. Occasionally I look for a poem just because it will give me something to carry around in my head all day. I think narrative poems are great for beginners. Robert Service tells funny stories. C.S. Lewis tells good stories, too. Some of the Romantic and Victorian poets wrote narrative verse–The Lady of Shalott has always been a favorite of mine. For people who already read poetry and want to branch out, I’d recommend comparing translations of something like Rilke’s Duino Elegies. I’ve done this all my life, searching for the one that first made me love them, and still haven’t found it. But I’ve found a lot of good phrases along the way. Who knows, at this point maybe I wouldn’t be as fond of that original translation as I was at the age of 14 or so. I also recommend browsing. I have the luck to work in a college library, so each month I go and flip through the new volumes of poetry to see what I might like. In terms of favorite and perhaps less-read poets, I think everybody should try more poems by Wallace Stevens. Necromancy Never Pays is not strictly about poetry, but as someone who is in the academic world, how important do you think talking about poetry online is and why? I am “of” the academic world, but not so much “in.” I think people in a liminal position notice more about their surroundings, and that’s part of what poetry does; it offers new perspectives. Talking about poetry online is as essential as anything I’ve ever done in my life. Most people need more poetry, but they don’t often know it. Blogging about poems used to be an extension of teaching about them, for me, but now that I’m not teaching poetry in the classroom anymore, I’m re-discovering some of those poems in a more personal way, which I think is the only way to share a love of poetry. It works on emotions, so showing why you love it involves feelings. I’m thinking about a way to make a John Donne poem accessible to readers of my blog (probably The Flea), still re-reading Todd Davis, sampling Katrina Vandenberg’s Atlas (this was a recommendation from another blogger), and making my way through Maureen McLane’s My Poets. The world of poetry and its future? People will always be reading and writing poetry. I hope that my contribution to this world will be to help open it up and remind people of how to experience it for themselves. So many times when poetry is served up at the table, people push back and say, “I’m full already” when what they mean is more like the British sometimes describe their reaction to being offered a French gateau for dessert: “that’s much too rich for me.” A taste for poetry is as basic as a child’s longing for sweets. The trick is to keep developing your tastes, so you can appreciate the more subtle flavors. Thanks for continuing to keep those of us who love poetry organized a bit, Serena. You’re always creating more community and enthusiasm. You’re welcome, Jeanne, and thank you for answering these questions at the last minute. My review of The Paper Garden by Molly Peacock posted last week. The cover and the illustrations of Delany’s work is stunning, and like the multilayered mosaicks, Peacock has created an equally beautiful biographical collage that layers the works of Delany over the events in her life and sneaks in tidbits from the author’s own past. I hope you have a chance to read the review and to read this interview with the author about writing, Mary Delany, and the Virtual Poetry Circle. 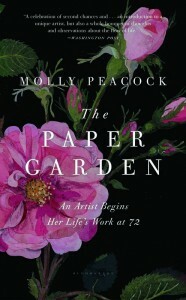 The Paper Garden is a biography of an older woman, Mary Delany, embarking on an artistic journey late in her life. What about her story grabbed your attention and how has it inspired you or helped you to re-examine your own life? Mrs. Delany’s work inspired me since I first saw it in 1986; the cut paper flowers are so magnificent! But it was really that she invented an art form at the age of 72 that got to me. I was 39 and establishing myself as an artist. Later, in 2003, I discovered more about Mrs. Delany’s life that inspired me. 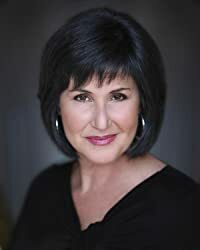 She had a marvelous mid-life marriage where she found herself branching out into many arts; it helped me understand how much my own marriage has influenced my own branching out from poetry to prose. Could you explain a little bit about the differences between writing poetry, memoir, biography, and prose? How are they the same? A lyric poem funnels down to an instant of revelation; it is almost as if the poem stops time, that the only dimension in a lyric poem is space. In that way, it’s like a painting. But prose unfolds in time; and time contains both obstacles and revelations. Prose develops, the way characters and situations do. It requires a flow. A poem is an instant, lightning across the sky. Prose is before the storm, the storm, after the storm. I first read your book How to Read a Poem in 2009, and it inspired me (ever since) to begin the Virtual Poetry Circle in which I post a poem each Saturday of the week for readers to read, enjoy, and offer up their impressions. Have you engaged in poetry circles on a consistent basis and/or have you had any feedback from others who have taken up with a poetry circle? Any further advice for Virtual Poetry Circle participants about reading and discussing poems? Thank you for creating The Virtual Poetry Circle! My advice is to incorporate a mix of poems, some golden oldies like “Ozymandias” by Shelley; some translations, like “The Word Exchange” edited by Michael Matto and Greg Delanty, with Anglo Saxon poems; some forms of poetry, like “Villanelles,” a new anthology edited by Annie Finch; some ancient poems like “Greek Lyric Poetry” translated by Sherod Santos; and some younger poets like Beth Ann Fennelly and A.E. Stallings. I think it’s always great when participants focus on specific language, rather than generalizing. When a poem gives you a certain feeling, you can try to locate the exact words, or sounds, or rhythm, or syntax that prompted it. Looking for the specific moment in the poem that prompted your feeling often leads to further revelation. If you were expected to describe yourself and your work in 10 words or less, what would you say? How about 11 words? 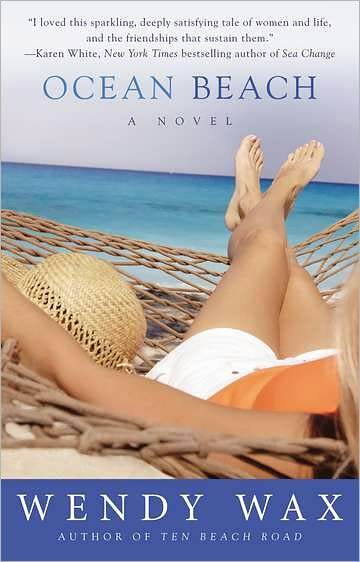 A woman writer fascinated by inner life and the real world. Finally, as a poet and a writer, do you feel that despite The Paper Garden‘s deeply personal connections that it should reach a wider audience? Do you think writing in general should bring about social activism, like the poets of the Split This Rock Poetry Festival? I am so gratified that The Paper Garden has reached a large audience! Gardeners, artists, people facing late-life challenges, people who’ve always felt they had a special imaginative spurt inside them, history buffs, romantics of all ages, young and old creative people have all been drawn to the story of Mrs. Delany. She’s a force! I think writing unexpectedly brings about social activism. Writing has to be internal first. But bringing the inner life to the greater public can spark oceanic changes. Thanks, Molly, for answering my questions. As many of you know, I love a good literary and book festival, and living in the Washington, D.C., area has given me a great number of opportunities to meet some great local and best-selling authors. I’ve only attended the Gaithersburg Book Festival once, last year, and it is now in its third year, which is promising to be bigger and even better than last year’s festival. This year, there are some great literary and local powerhouse authors and poets, as well as musicians, including beloved Sarah Pekkanen and Sarah McCoy. As a D.C. Literature Examiner, I’ve been posting reviews, interviewing authors, and generally talking about all the goodies that will be present at the festival this year — including an interview with Stuart O’Nan by Ron Charles (Also check out my review of The Odds). Today, I want to share with you my interview with Gaithersburg Book Festival Chair and City Council member Jud Ashman. Please give him a warm welcome. 1. The Washington, D.C./Baltimore area has a multitude of literary festivals from the National Book Festival and Baltimore Book Festival to the lesser know literary festival in Bethesda and the City Lit festival. What makes the Gaithersburg Book Festival a must for all readers and what about it is unique compared to the other events in the area? I like to think that we combine the best of all of these events into one spectacular day of literary awesomeness! We have the high-caliber authors of the National Book Festival, the up-and-comers you might find at City Lit or Baltimore, and the more local authors you might find at some of the Bethesda venues. It’s a place where you can see and meet your favorite authors and discover some fabulous new ones. Our Festival is a big scale event, but it feels intimate and the fans tend to get excellent face time with the authors. We try to include a wide array of genres, from literary fiction to history, humor to cooking, current affairs to mystery, sports to children’s books, young adult to women’s lit – there’s something for everyone. Our other programming sets us apart as well. For aspiring and hobby writers, we have writing workshops. We host what’s called a “Children’s Village” which is full of literary-themed activities for the kids. And you can sit back and relax at our Coffee House while you enjoy a day’s worth of poetry readings and music. Oh, and by the way, parking and admission are free! 2a. You were one of the primary forces behind creating the festival. What was your motivation? Two things you need to know about me… 1) I love great books; and 2) I tend to share my passions with everyone within earshot! Since I’ve always been a big reader, when Laura Bush and the Library of Congress founded the National Book Festival back in 2001, it immediately became my favorite area event. Every year, I’d go and just lose myself in the rapture and inspiration of great stories, great storytellers, and the wit, wisdom, and joy that pervades the atmosphere there. Flash forward to 2008 when we all knew that this would be the last year of the Bush Administration (including festival co-founder Laura Bush), but we didn’t know who would be taking their place, nor whether the new folks would opt to continue the National Book Festival. I distinctly remember Dr. James Billington, the Librarian of Congress, coming to the stage and urging the attendees to contact the new administration and ask that they continue this wonderful event. – There are a ton of nationally known authors and journalists in the DC area. Most are within an hour’s drive of Gaithersburg. – There are a ton of readers in the DC area. In fact, it’s the most literate metro area in the country, as measured in an annual study. – The City of Gaithersburg has long supported the arts and produced and hosted some outstanding performances and events. But it could still benefit from an enhanced cultural identity. So, I pitched it, informally, to the Mayor and my colleagues on the City Council. They probably didn’t fully understand the scale of what I was proposing, but they all liked the idea and encouraged me to run with it. 2b. How did you get started wooing authors and publishers to the event? It started with ‘friends of friends.’ One of the advantages of being in a public position is that I come into contact with a lot of people – and those people come into contact with a lot of people, and so on. When I started asking around, it turned out that a good friend of mine works with Alice McDermott’s husband, who was willing to pass along an invite to his great author/wife, which she (thank goodness!) accepted. Likewise, another friend knew sportswriter and best-selling author John Feinstein and was able to help get him on board. We worked our contacts very hard in that first year, and were able to put together an excellent lineup that included 56 authors, a Pulitzer winner, a National Book Award winner, a Newbery Medal winner, and about a dozen best-sellers. Last year, we had more of everything. Over time, we’ve developed effective working relationships with a number of publicists at some of the big publishing houses, who assist us with all sorts of high-profile authors. This year, for example, we have authors coming in from San Francisco, El Paso, Martha’s Vineyard, San Diego, New York City and all sorts of other places. 3. In 2011, there were a great many fiction and nonfiction authors present, but not too many, if any poets. How will the festival be improved or expanded in 2012? Will poetry be included in this year’s festival? If so, how? Actually, we had some terrific poets! They included current Maryland Poet Laureate Stanley Plumly, former laureate Linda Pastan, Richard Peabody, Michele Wolf, and a few others who are of more local renown. We dedicate about half of our programming at the Coffee House to poetry readings and it’s an aspect of the Festival we’re really proud of. Any interested poets should fill out and submit and application to present, which can be found on our Website. 4. One of the most eye-catching moments of the 2011 festival was the activities for children, including magicians, a unicyclist, and Dr. Seuss reading tent. What are some of the activities parents can look forward to this year? Will there be some specific children’s authors that parents should consider seeing? We put all of our children’s programming into an area we call the “Children’s Village.” There will be authors and readings and arts & crafts activities, writing workshops, musical performances, and, I should mention, that one of our authors, Leah Taylor, will be bringing a pony! We also have a couple superb authors in the Teen/Young Adult category: Laura McNeal (finalist for the National Book Award), and Matthew Quick, whose book “Boy21” to be released this Spring, is going to be big! 5. The festival hosts a short story contest for high school students. Are there plans in the works to expand the contest to other genres, such as poetry and essay? And to include an adult category? Thanks for bringing up our High School Short Story Contest. This is just our second year doing it, and we’ve been blown away by the results, both in the number of participants and in the quality of the work. We’d certainly like to expand the contest and hope to see it blossom into a multi-category, multi-genre endeavor, but the challenge, for now, is manpower, including people qualified to read and judge the entries. Much of the current contest is run by volunteers. They promote it, administer it, they help find sponsorships for the winners, read the initial entries and narrow down to finalists, and plan the awards ceremony. It’s a big undertaking. So, our capacity to expand the contest will depend on the manpower we’re able to drum up. 6. Also, are there future plans to include additional publishing industry topics among the panels, such as the influence of book bloggers and other online reviewers outside of the mainstream media? Absolutely. Last year, we had a “State of the Book” panel, which featured a publisher, an editor, an agent, and a bookseller. It was a terrific conversation about the evolution of the industry. Actually, you can still see the video on C-SPAN online here. Thanks, Jud, for answering my questions. If you haven’t come to the DC area yet, here’s just another incentive. If you haven’t checked out my latest articles on D.C. Literature Examiner, you’ll want to check out my interview with Sarah Pekkanen, Eric Goodman, and my reviews of their books, plus a review of Richard Peabody’s poetry book and more information about the upcoming panelists, workshops, and activities at the festival on Saturday, May 19.